Perfect for when you can not find the ornaments at Walmart. A nice touch for the Christmas in Heaven signs. Make with wood if you can or follow the tutorial below on how to layer cardstock to get the same effect. Stay with me here, let’s get into how to use this file. I plan on making a video, but I know there are lots of people itching to get the file so they have it for their crafting needs. You can click the photo above to see my notes. 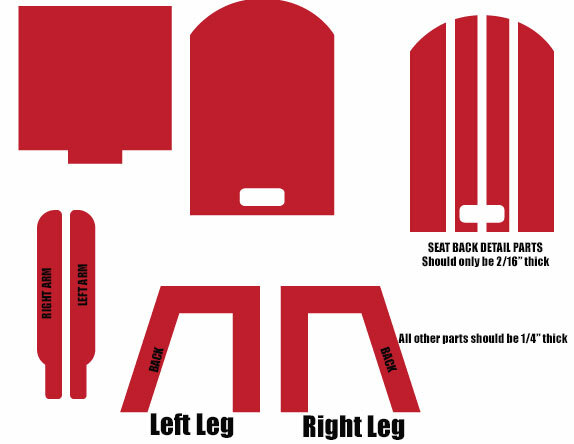 The seat back detail parts you need enough layers to make it 2/16″ thick. For the cardstock I was using that was 6 layers. The rest of the chair had 10 layers and clearly needed more to make it get to the 1/4″ it should be. So maybe on the rest of the chair it could have used 20 layers. Now that those notes are out of the way here is what you do. Download the file and upload into Design Space. For starters send the entire file to mat together and change the project quantity to 6. You will end up with 1 and a half mats being used. Make sure to use solid core cardstock or you can use white cardstock and paint it with acrylic paint after the fact like I did for the above sample. Once you have cut all those parts pull them off and make neat stacks of those and then go back into Design Space. Hide the 4 Seat Back Detail parts and send to mat again. This time cutting 14 project copies. This will use 2 and a half mats. While these cut, start gluing the layers of the seat back detail together and all the other layers that have been cut. Once everything is cut just keep gluing matching layers together. Then make sure you glue the seat back detail parts to the seat back. Making sure to match the shape and details. Let all parts dry overnight if you used something like Elmers before trying to assemble the chair. Assembly is sort of self-explanatory. The Seat bottom slips into the hole in the back and the legs and arms get glued together and then to each side of the chair. The part of the leg that is angled goes towards the back and the skinny part of the arms goes towards the back. Any questions just hit me up and I will be glad to help you out. I plan on making a video this weekend. You could also use this pattern with Balsa wood, or when the Knife Blade for the Cricut Maker comes out this might end up being only a 2 layer project for wood.